Growth form: Annual grass. Flowering. Apr. Status: Native. Rare. Also recorded: UAE. 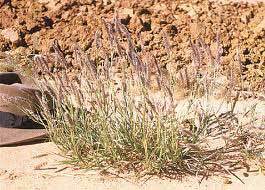 Habitat & distribution: Recorded from cultivated lands in C Qatar by Batanouny, but presumably also occurs in natural areas with sandy and silty soils.